The Graphic Cheat Sheet offers you suggestions for graphic types that best convey various concepts in simple, complex, and quantitative ways. For example, if you want to show Synergy, scroll down the far left column to the row labeled Synergy. Under the Simple column (for information not too intricate), you will see suggestions like a building block graphic, chain graphic, or pyramid graphic. For more robust concepts of Synergy, you can look under the Complex column and find suggestions like a funnel graphic, vee diagram, collage, or a stacked graphic. For numeric concepts of Synergy, look under the Quantitative column to find a pie chart and dashboard graphic. Whenever you're stuck with how to visually communicate your ideas, break out this cheat sheet! I created the sheet to give you new ideas for graphics and force you to consider different ways to show your information. Maybe for Hierarchy, you always used a pyramid graphic. However, in reviewing the sheet, you notice that a stair graphic or a temple graphic might work better and offer another way to visually communicate your information and keep your presentations and marketing materials fresh. Hope this sheet helps you find better and more creative ways to communicate your ideas. As always, you can email me at info@BillionDollarGraphics.com with any suggestions for articles or other helpful resources or graphic questions. 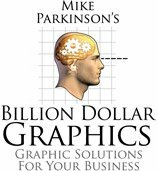 Want to learn more about choosing the right graphics and how to improve your presentations? Check out The Presentation Summit in Scottsdale, Arizona, October 7th-10th. I'll be giving a workshop as well as exhibiting our new Get My Graphic site. There will be amazing experts on presenting like Rick Altman, Julie Terberg, Connie Malamed, Dave Paradi, Geetesh Bajaj, Carmen Taran, and many more. We'll also be giving out printed copies of our Graphic Cheat Sheet during our session and at our booth at The Presentation Summit in Scottsdale, Arizona, October 7th-10th, so stop by our booth and workshop to say "hi!"